Jonathan Flatley. Affective Mapping: Melancholia and the Politics of Modernism. Harvard University Press, 2008. 272 pp. How might we articulate a potential relationship between political subjectivity and aesthetic practice? 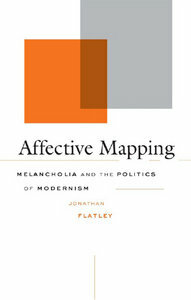 In his compelling and incisive study, Affective Mapping: Melancholia and the Politics of Modernism, Jonathan Flatley sets out to describe precisely that tenuous and delicate interaction between politics and aesthetics, and between subjectivity and praxis. Furthermore, Flatley attempts to stage a purposive meeting between two otherwise disparate fields, namely psychoanalytic theory and affect studies, with the hope that such an encounter might better serve us in our quest to understand the modern subject. I use the word “purposive” here quite intentionally to underscore that within his project, Flatley shows us how a close reading of psychoanalytic theory, by way of Freud does not require us to abstract affect from how we think of the psychic life of subjectivity. To start with, I must state my initial skepticism. As someone deeply interested and, at times, invested in the corpus of psychoanalytic theory, I arrive at the study of affect, and its use within the space of literary criticism with something of an analyst’s doubt. Let me explain myself here. Psychoanalysis, the study of that mysterious site of the unconscious, rendering itself as the possibility for “working out”–this “working out” is of great importance here–historic and subjective trauma does not often sit well against and/or alongside the study of seemingly visible, noticeable, observable affect, per se. Analytically speaking, trauma, the confrontation with the apparent Real, renders itself to be inexpressible even in the best of times. This perceived impossibility to represent trauma–in either word or image–seems to struggle against the desire for a kind of “realism” that affect claims to make possible. Flatley’s intriguing study not only assuaged my initial doubts about the bringing together of psychoanalysis and affect studies, but allowed me to gain greater clarity into the potential of bringing together these fields such that we might respond to historical trauma, subject formation, subjugation, and oppression in more nuanced and rigorous ways. Affective Mapping is structured and spaced out along five chapters, preceded by an introduction, within which Flatley immediately states his project’s ambition, and an essential–I will explain why shortly–glossary of terms, which will then come up within the chapters to follow. As Flatley states in his introduction, ‘the writing of this book originated in [his] desire to explain something that seemed simultaneously self-evident and poorly understood … not all melancholias are depressing’ (1). It is this conflicting simultaneity of the thesis he claims–between being both self-evident and poorly understood–that Flatley attempts to explicate upon within his work that centers on the contested terrain of the experience of melancholia. By splitting melancholia into two, namely those that tend toward being depressive and those that have an affirming capacity attached to them, Flatley’s project takes on the task of studying quite closely the affect of melancholia, assuming that there is something both subjectively and politically fecund about the presumably affirmative forms of melancholia. While such attempts at categorizing might offer much room for debate, and while it might be of political and/or theoretical interest to think about melancholia as either being depressive or affirmative, I was unsure as to how Flatley came to this space of what he claims to be an apparent split. Furthermore, I was drawn to wonder what precisely might delineate melancholia into something, let us for the time being call it an experience that is either affirmative or depressive. By extension, it bequeathed me to ask as to why something under the banner of being a depressive melancholia might not be in and of itself as productive or as generative as an affirmative sort of melancholia. My concern with this splitting, or rather, the articulation that such a split might actually exist lies within the problem of Flatley not exactly outlining, within his text, at least in my reading of it, a clear distinction between the two, or any such guideline for this delineation. What makes one sort of melancholia, affectually speaking, affirmative and thereby productive politically, whilst rendering other forms of melancholia as depressive and antithetical to the possibility of politics, seems to me, to be a central question left unattended. Setting aside the difficulty of understanding what this distinction–between affirmation and depression–might look like, and assuming that we follow Flatley’s lead into thinking of something that might be understood as an affirmative melancholia, then what he suggests is that a channeling of this sort of melancholia into aesthetic practice–such as writing, as done by the writers he examines–enables for a more nuanced reading of how modernity has determined subjectivity. If as Flatley suggests (and I agree wholeheartedly with him on this point), we come to understand the modern subject through her/his intrinsic alienation, through her/his ‘self-estrangement’ (6) from her/himself, then understanding the historical potency of the modern subject’s melancholic position might render the subject as politically-charged, precisely through an examination of this moment of self-estrangement. My push, however, in furthering our consideration of melancholia would be to ask what might be the distinction, if any, between this self-estrangement and something akin to the enactment of self-reflection. Earlier, I mentioned an essential glossary of terms that precedes the five chapters of the book (and immediately follows the Introduction). I found this glossary an interesting attempt to offer up definitions to a series of deeply debated terms of reference; terms which will then make appearances throughout Flatley’s theorizing. The terms outlined here are affect, emotion, mood, and structure of feeling. This attempt at a glossary is revelatory in a sense because it provides us with much to consider in how we enter into reading Flatley’s study of melancholia and its relationship to subjectivity and the practice of aesthetics. The bringing together of politics and aesthetics, being a central concern for him, is enacted by looking closely at how he describes melancholia, as resulting from the modern subject’s self-estrangement from her/himself, as either affect, emotion, mood, and/or a structure of feeling. These terms of references allow us to think through how he explains a subject might come to understand her/himself within the context of a politicized sense of her/his position within history. The contribution made by Flatley in furthering our understanding of these terms, within the context of the debates that surround such exercises in definition, is quite important to note, especially since this also adds to the struggle between bringing psychoanalysis and affect studies together. The first chapter opens up with a detailed outline of the history of the study of melancholia. This serves adequately as both review and overview – for those of us familiar with this history, names such as Klibansky, Burton, Ficino, Goethe and Baudelaire resonate quite well; while for those for whom the study of melancholia is an altogether new endeavor, Flatley’s historical trajectory serves as a well-thought out primer that energizes the eager reader to take the arc into her/his own direction of study. This historical outlining of the study of melancholia is centered upon the notion that modernity’s experience–perhaps, the fundamental experience of modernity–is founded upon, or rather inscribed within, a subject’s experience of loss. As Flatley describes modernity, ‘the very origin of the word … , from modernus, meaning “now” or “of today” implies a problematic sense of anteriority, the sense that the past is lost and gone’ (28). Within such a context, the hope is to explain how the subject understands, comes to terms with, and identifies with this loss within the context of her/his historical position. Since loss and melancholia have herein been linked temporally, as an experience between the past and the present, Flatley’s historicizing of the study of melancholia then leads him to read through (and quite closely, might I add) Freud’s work on mourning and melancholia. As an astute reader of Freud, what follows in this chapter is Flatley’s brilliant and detailed description of key concepts that inform psychoanalytic theory – specifically that which concerns itself with the experiences of loss, attachment, tranference, introjection, projection, and identification; all of which have their parts to play in Freud’s own understanding of melancholia. It gives the reader a way to enter into psychoanalytic theory without having to be heavily informed by it. This is a practice at which Flatley excels – the insightful ability to both read through and breakdown concepts in an incredibly accessible and persuasive manner that act both as review and overview. The attention given to Freud, here, as Flatley notes himself, is ‘[to offer] a kind of baseline paradigm for a modernist theory of melancholia, which will serve … as a point of reference’ (43). In doing so, he is able to then tie Freudian melancholia to his own understanding of it based on the theory of history conceived of by Walter Benjamin, where melancholia is designated the role of methodology by Flatley. As methodological process, Flatley means to intend that melancholia ‘might allow one to gain access to the historical origin of one’s suffering, and indeed to the logic of historicity itself’ (65). Flatley arrives at this “logic of historicity”, through the use of ‘melancholia as method’ (64), within the space of his second chapter, wherein he conceptualizes the affective map, which in turn becomes the medium by which subjectivity is tied to its political realization. Utilizing Frederic Jameson’s well-worn notion of the “cognitive map’”, wherein ‘one requires a cognitive map of social space for a sense of agency in the world’ (77), Flatley explains his exercise of “affective mapping”, ‘to indicate the affective aspects of maps that guide us through … our spatial environments’ (77). As he goes on to explain, such an ‘affective map is neither fixed nor stable’ (78). An affective map is, for him, a cumulative and recuperative exercise in trying to understand how structures of feelings and affective moods determine political subjectivity within spatial environments.. This, in turn, is expected to facilitate the formation and articulation of what Flatley believes to be ‘agential collectives’ (82). In what is quite a radical move, precisely because, here again, he brings together psychoanalysis and the study of affect, Flatley attempts to extrapolate on how such an agential collective comes to be through Adorno’s description of ‘aesthetic comportment … [as the] place where one … makes contact with an other, based on shared affective experience’ (83). For him, ‘affect is the shuttle on which history makes its way into the aesthetic’ (81). He goes onto describe how this takes place within the context of his close readings of Henry James’s The Turn of the Screw, W. E. B. Du Bois’s Souls of Black Folk, and Andrei Platonov’s Chevengur, , in the subsequent three chapters of his book. In chapter three, James’s The Turn of the Screw becomes a textual space in which affectivity is described as the exercise of ‘reading into’ (87) the narrative. Taking his cue from the logic of transference described by Freud, Flatley interprets affect as the site through which he “reads into” James’s narrative. He, then, takes this exercise further by “reading into” the central character of the governess in the story, whose “reading into” other characters in the narrative and how they perceive her, continues to enact the mapping practice that Flatley states is central to his understanding of how James historicizes subjectivity. Chapter four sees Flatley carrying out a detailed study of Du Bois’s seminal text in order to underpin the affect that lies beneath the experience of “double consciousness”. Double consciousness explained by Flatley as the ‘desire to be like someone [and] the desire to replace and thus destroy that person’ (124) becomes the affective bind in which Du Bois finds his subjectivity locked within his own understanding of himself within the history of America. In the final chapter, chapter five, affectivity under the sign of Russian socialism is described within the site of the formation of communal bonds through friendships, specifically male friendships, becomes the way in which a collective melancholia might mean something akin to the possibility of forming an agential collective. I want to conclude this review on two notes of interest – perhaps, personal at best. Firstly, while Flatley, himself, admits to the idea that ‘the texts [he chose] are by no means the only ones [he] might have written about’ (8), I would have liked to have seen a more intricate explanation as to his specific choice of texts – beyond all of them being texts written at either the end of the 19th century or at the beginning of the 20th century. The absence of a clear explanation leads to open concerns about how these texts might be, if in any way, connected to one another, beyond the affective, albeit divergent, impulses embedded within them. A sustained feminist critique of the choice of texts made by Flatley would perhaps argue that he, at times, privileges a masculine form of melancholia, where in transcendence seems to be the affective output in the final analysis. Finally, I want to turn my attention to the first part of the title of my review, Can Melancholia Speak?. Flatley’s compelling study of the affective terrain upon which subjectivity is inscribed reminded me of another inscription, where the body itself became a political text. In reading Flatley’s work, I was effectively reminded of the last part of Gayatri Chakravorty Spivak’s brilliant essay Can the Subaltern Speak?, wherein she describes the political suicide of Bhuvaneshwari Bhaduri. I was compelled, then, to ask as to what might happen if we were to think of subaltern or other-ed subjectivity alongside inscriptions of historicity made through and about the subject’s self-estrangement from her/himself. Can, in that vein, the subject’s melancholia speak? And, if so, what, then, is it saying to us? And who is this “us”, a tenuous affective collective in and of itself that hears its voice amidst the clamor of history’s echoes? Ricky Varghese is a doctoral candidate at the Department of Sociology and Equity Studies in Education at the University of Toronto. He is currently completing a dissertation entitled The Writing of Memory: Freud and the Historical Novel, where he is attempting to explain the relationship between memory, history, and the writing of fiction. His other research interests include film theory, art criticism, the history of photography, trauma studies, and historic memory. He is also author of Unbearable Heartbeat: Reading Ethics and Politics in Derrida, Levinas, and Kundera (VDM, 2008). Once done his dissertation, he hopes to train as a psychoanalyst.